Meet Claude! 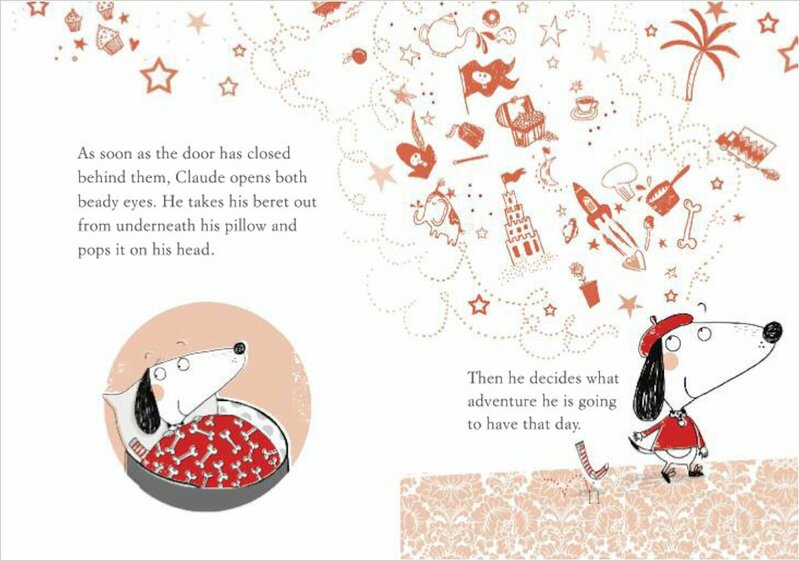 He’s a small, plump dog who wears a beret and a lovely red jumper. But Claude is no ordinary dog. He leads an extraordinary life! When Mr and Mrs Shinyshoes set off for work one day, Claude decides it’s time for a trip to the city. With his best friend Sir Bobblysock – a slightly grubby sock – Claude goes off in search of bright lights and excitement. And he quickly finds it! Together, he and Sir Bobblysocks have tea in a café, go shopping and visit a museum. It’s all very normal – until a criminal strikes! Alex T. Smith was born in 1985 and has drawn and written stories since he could hold a pencil. After considering several career options (space traveler, cake maker, professional rabbit), Alex decided to train to do the job he’d wanted to do since he was five – a children’s books illustrator. Alex graduated with a 1st Class Hons degree in Illustration and, having won second place in the Macmillan Prize for Children’s Picture Book Illustration in his final year, began working on his first commission as he put his degree show up! 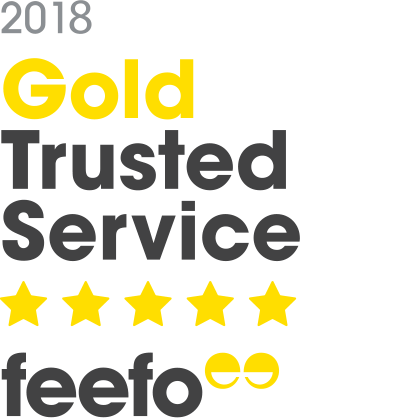 Since then Alex has gone on to write and illustrate his own books – many of which have won prizes and have been read on TV during the Bedtime Hour on CBeebies, as well as illustrating books for several different authors. 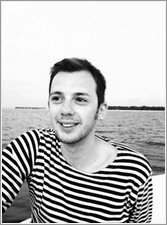 Alex is also the creator of the CLAUDE series for early readers. 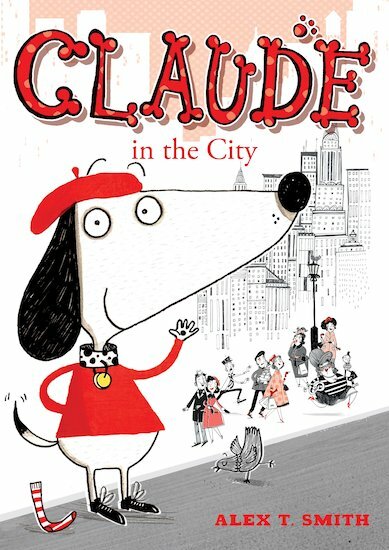 CLAUDE in the City was selected for the Richard and Judy Children’s Book Club 2011 and was shortlisted for the Waterstones Children’s Book Prize in 2012. When not working, Alex enjoys doodling in his sketchbook, reading, people-watching and eavesdropping. He is also a big fan of cake and a nice cup of tea and a sit down. He lives with and under the constant ‘supervision’ of his canine companions – two very tiny, very naughty chihuahuas (Coco and Mr. Bongo) and an ancient and very bossy Yorkshire Terrier, Lucy Locket. My daughter 8 y.o. is really impressed by this book. Very creative pictures, funny story. Letters are big enough, she likes read on her own. Book is not too big, you can take it with you every where. Pictures are really fantastic, interesting even for adults. A fun and quirky book for first readers.I was utterly charmed by the adventures of Claude and Sir Bobblysock and by the delightful illustrations throughout. As with all good illustrated texts the pictures enhance rather than just represent the story. 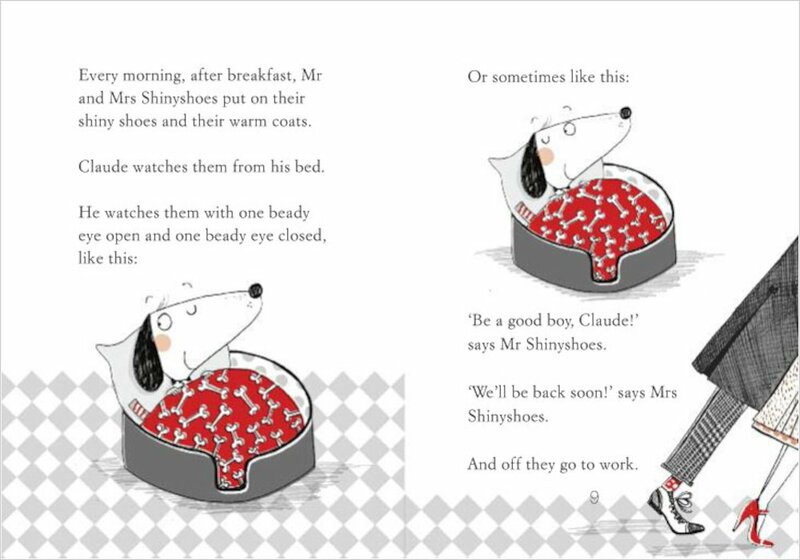 Claude lives the kind of life we all hope our pets are enjoying whilst we are at work and the humour , for example Dr Achinbum, will also appeal to the adults who read this book with their child. 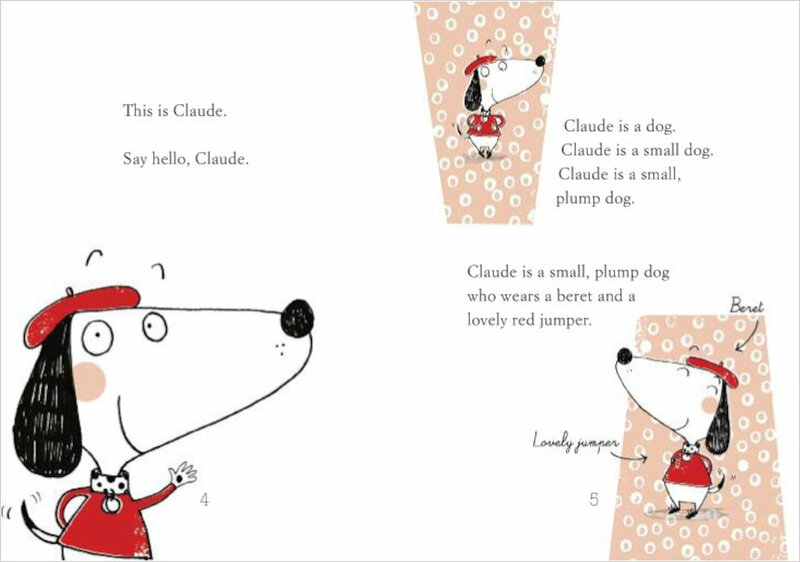 This is about a dog called Claude who decides to have some fun in the city. I loved Claude in the City because the illustrations were like you see in real life but in a cartoon way. Claude is like a dog that pretends to stay in bed until his owners leave the house. 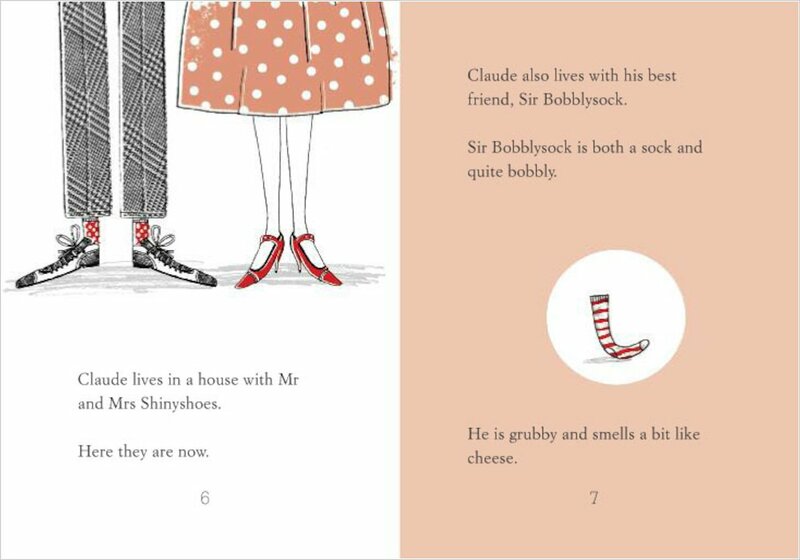 When the owners Mr and Mrs Shinyshoes do leave to go to work, Claude & his best friend Sir Bobblysock (who is a sock) have fun adventures. Claude isn’t meant to leave the house or to go into the city but he did once when Mr and Mrs Shinyshoes went to work. Claude likes to wear berets, and when he was in the city he saw a beret shop and couldn’t resist buying all the berets! Another building Claude and Sir Bobblysock visited was the Art Gallery. They got to see huge sculptures, small sculptures and very very rude sculptures. While they were in the art gallery, a robber came in and was trying to steal all of the art. The robber had a sculpture but with Claude was carrying his boxes of berets he bought earlier in the day and the robber ran right into him making the sculpture go flying!! Luckily Claude caught it and saved the day as the robber was caught! The book is aimed for 5-7 year olds and kids who really like illustrated books.